Allen, Texas - The Allen Americans, ECHL affiliate of the Minnesota Wild and Globe Life, are proud to announce the signing of defenseman Josh Atkinson to a contract for the 2018-2019 season. 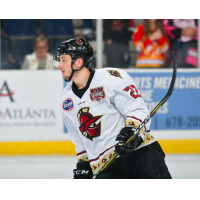 Josh Atkinson, a 6-foot-1, 195-pound defenseman joins the Americans after playing the last three seasons with the Atlanta Gladiators. He had 14 points in 32 games last season with Atlanta. He also played in two games in the American Hockey League last year with Chicago. "Josh skates really well and is physical, said Americans Head Coach Steve Martinson. "He had great numbers as a rookie, and I expect him to back up those numbers this year." The resident of Spruce Grove, Alberta had his best season as a professional two seasons ago with the Gladiators, tallying 50 points in 66 games. He played his college hockey at the University of Alaska-Fairbanks, where he was a member of the WCHA All-Academic Team in 2013-2014. The Americans open their 10th training camp this October. Allen has qualified for the playoffs in all nine seasons of AA Hockey (Double A). The Americans home opener is on October 20th against Wichita. Call 972-912-1000 for tickets. Season Tickets - Lock in your seats NOW for the 2018-2019 Allen Americans Season. Contact your Americans Ticket Representative TODAY by calling 972-912-1000. Watch/Listen Live - Catch all Allen Americans games this season on ECHL TV pay per-view or Mixlr.com. Be sure to download the mixlr app for your i-phone or android and never miss a minute of the action.